Six month’s after his brother Tom’s disappearance, Matthew Ryan is released from the care home his father placed him in to recover. But life is no easier for Matthew now he’s back in the family council flat on a grey South London estate. His father, Jake, silently seethes, a violent man staying just this side of violence, blaming his oldest so for the loss of his youngest. Matthew was partying whilst his brother wandered off. The local paper’s reporter is trying to dig up some dirt on the unsolved case; the social worker and local vicar are putting in the tuppence-worth, and all Matthew wants to do is to be left alone to do… well, what does one do when you don’t know if your brother’s alive or dead, and you know you were to blame? The Disappeared captures the grim reality that, for some, is life on a London council estate, with its peer pressures, gangs and neighbours too close for comfort, stained concrete and shadowed passageways, killing time and hope for all but the most determined. And Matthew is determined. Harry Treadaway’s portrayal of a guilt-ridden, scared and lonely teenager, but one with a backbone of decency and sympathy is outstanding and vital. His relationship with Jake, his dad, verges on the unbearable as the viewer just wants them to communicate with each other, just talk why don’t you? But Jake is in a far darker place than his son, a place for adults only. The filmmakers’ collective vision of the Ryans’ flat is soul-destroying in itself, a set of bleak, stained rooms with paper-thin walls, effectively dampening the trapped emotions of father and son. Matthew watches recorded television coverage of the news conferences and his dad’s desperate appeals on the old VHS. On one of these old tapes Matthew hears his name being whispered. Tom’s voice, he’s sure. It happens again. Circumstances contrive to prevent him playing the tape to his sceptical best mate, the refreshingly raw and begrudgingly loyal Simon, (played by Tom Felton, most famous for his role as Draco Malfoy in the Harry Potter films). His off-hand comment sets Matthew off down the route of reluctant and self-questioning amateur paranormal investigator as he sets up an old cassette recorder to capture a bit of the old Electronic Voice Phenemona. The voice is there again, this time with a new message. Matthew starts to see his brother around the estate, and when Simon’s sister goes missing, he feels he has no choice but to follow his instinct, and the voices, whatever the consequences. 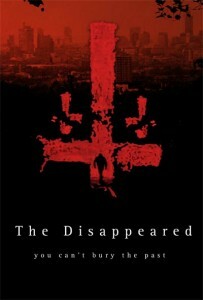 The Disappeared is a contemporary urban ghost story. It’s been likened to The Omen and The Sixth Sense in some of the press I’ve read, but to my mind, it’s also possible to trace influences way back to the good old, and very British days, of Hammer and Amicus, and that’s not a bad thing at all, but to say more would be to give the plot away. There are a couple of hokey effects designed to show the true nature of the abductor, but on the whole, these don’t detract from Matthew’s ghostly, and carefully placed, encounters. It’s a haunted area, this part of London, says one of the characters. Director Johnny Kevorkian and cinematographer Diego Rodriguez draw a satanic map around a particular area of South London, from the concrete gothic of Matthew’s estate, to the wind-swept docks, and surrounding woods hiding decaying secret tunnels and their ancient contents. These places aren’t only haunted by spectres from the distant and not so distant past, as certain of today’s disaffected youth would no doubt tell you. In The Disappeared, every shadow’s a hoodie, every alcove a chance to hide, or to pounce, and it’s in these shadows that Kevorkian, Murphy and Rodriguez revel, imbuing the 70s architecture with teasing messages, relayed by very modern ghosts. The Disappeared is an adept depiction of sharp and honest dysfunctional dynamics, clammy-palm scares, occult secrets, brooding emotions and environments, escalating into a subterranean fight for life and justice for those beyond physical help. Go and see The Disappeared at the ICA from June 19th onwards. June 22nd has a special showing with the Director and stars, hosted by Alan Jones of Frightfest.